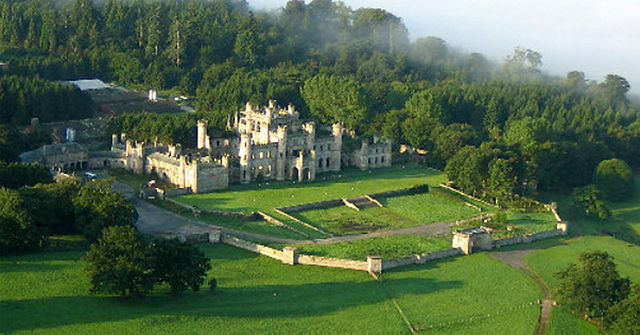 Notes: Lowther Castle is a country house in the historic county of Westmorland, which now forms part of the modern county of Cumbria, England. It has belonged to the Lowther family, latterly the Earls of Lonsdale, since the Middle Ages.In the late 17th century John Lowther, 1st Viscount Lonsdale rebuilt the family home, then known as Lowther Hall, on a grand scale. The current building is a castellated mansion which was built by Robert Smirke for William Lowther, 1st Earl of Lonsdale between 1806 and 1814, and it was only at that time that Lowther was designated a "castle". The family fortune was undermined by the extravagance of the 5th Earl of Lonsdale, a famous socialite, and the castle was closed in 1937. During the Second World War, it was used by a tank regiment. Its contents were removed in the late 1940s and the roof was removed in 1957. The shell is still owned by the Lowther Estate Trust. George Macartney, when visiting the summer retreat of the Chinese emperor in Chengde in 1793, could compare the magnificence of what he saw only with Lowther Hall: If any place in England can be said in any respect to have similar features to the western park, which I have seen this day, it is Lowther Hall in Westmoreland, which (when I knew it many years ago) from the extent of prospect, the grand surrounding objects, the noble situation, the diversity of surface, the extensive woods, and command of water, I thought might be rendered by a man of sense, spirit, and taste, the finest scene in the British dominions. In the 19th century, an East India Company ship, HCS Lowther Castle, was named after the estate. Lowther Castle Ship's Medical Log at Syracuse University.